March has come and gone and I am basically glad. All the small cold fronts and all the wind have kept things mixed up. The bait is still not here as I write this. The good news is that the kingfish have showed up and the threadfins which they like to eat are here but all the white bait hasn’t come in yet. Maybe last night was the last front we will see. It was rather weak anyway just lots of wind today—the 9th. We had some great trips in March even without the bait. We caught some nice trout, sheepshead, black drum, redfish, spanish macs, pompano and kingfish. When the wind wasn’t blowing the fishing was pretty good all on shrimp. Now that April has rolled in we should have good weather and good fishing for kingfish, spanish, trout, snook, snapper and grouper. April has always been a great time for the big trout. I love to see those big ones as they are so pretty. 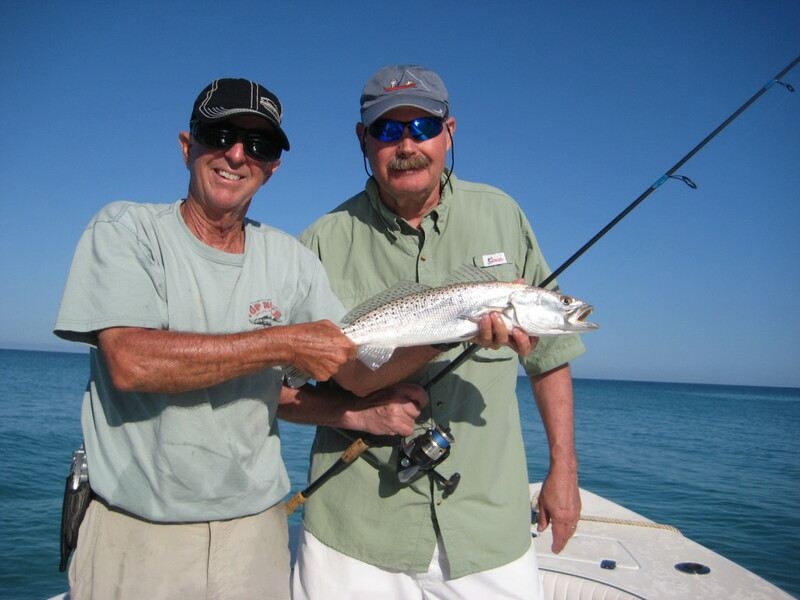 May will bring on the snook and tarpon so that is a busy time for us. Be sure and book early for those May June trips. See you soon! Capt Tom Sr. The weather was perfect today for an offshore trip with my good client Chuck Krause and his Brother in law John. These guys like to catch a few nice fish for the grill and the calm seas and mild temperatures made for a pleasant day on the gulf. We stared the day by catching some live sardines and stopping by the bait shop for shrimp and ice. Next we made our peaceful run 10 miles out to the 45 foot range and anchored on one of my good rocky bottom grouper holes. 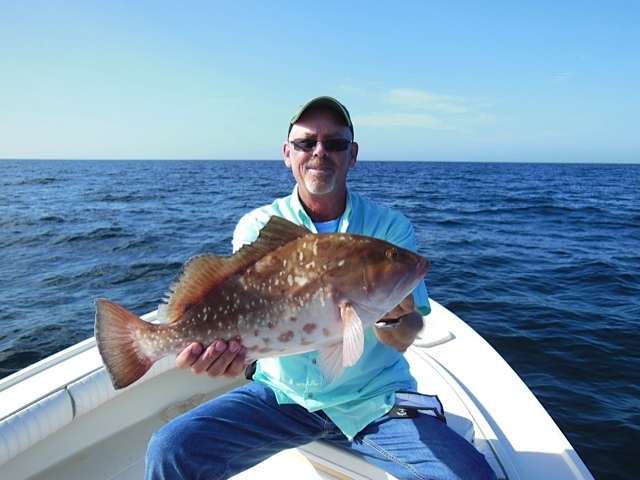 I normally catch nice gag grouper at this spot, but today the grouper were all reds. We caught many shorts and managed to get several nice ones in the keeper size range. Next stop was for snapper. 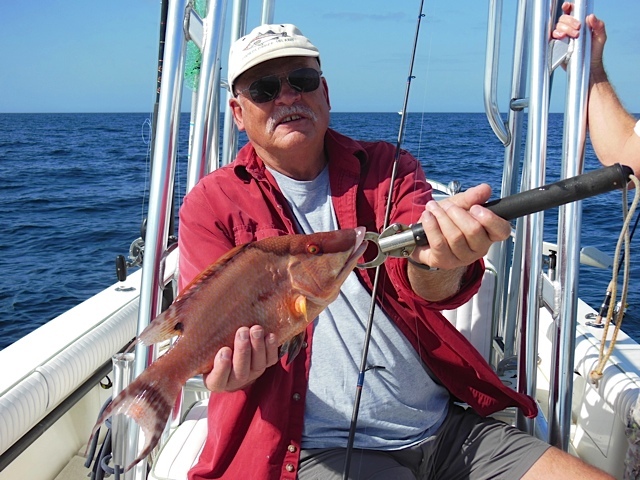 We usually get a good run of nice size mangrove snapper this time of year. I like to target them with shrimp on a light weight and light tackle. We did pretty well with a dozen or so for the cooler. Also managed a hog fish and some other mixed fish to make it interesting. The small amberjacks nearly broke chucks wrists because the drags were set pretty tight. I remember laughing a lot at chuck when he was pulling up those 10 pound jacks. They really put up a good fight. On the next stop, I headed back in to a 40 feet and tried one more time for a gag grouper. We found them alright. Chuck hit one right away, but was instantly rocked up and broke him off. That happened several time in a row and by the time I got the right tackle together for them the bite was done. Sometimes it helps to be a little bit away from the main structure when you are grouper fishing. If the fish will move to your position away from there rocky home it makes it easier to catch them some times. We caught some more red grouper and headed back in. Chuck took a few shots of our catch and I cleaned the catch for the guys to take home. Another really nice day on the gulf. Looks like a cold front will hit just before thanksgiving and might keep us off the water for a day or two. Happy Thanksgiving from us at Top Notch fishing to all of our clients and friends. Tight lines Capt. Tom Jr.